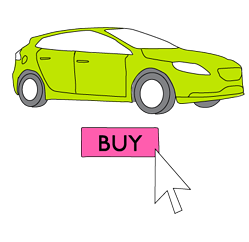 If you think that you won’t ever buy a new car online, think again. It might happen faster than you think. While the automotive industry is certainly struggling in Europe and some other parts of the world, hampered by overcapacity and economic turmoil in key markets, we saw a glimpse of the future this summer as three leading brands showcased that the future of car distribution and service lies online, and there’s evidence of more to come. It’s obvious to most people that we have changed our behaviour as consumers over the last decade. E-commerce in general has gone from something minor to becoming a natural part of peoples’ lives. We’ve gone from buying books and CDs, to clothes, to furniture, to used cars, to services like tickets and video rentals. We fulfil the majority of our banking needs online, while praising the time we save compared to our old physical ways of doing it. Yet when it comes to new cars the industry seem to have remained sceptical. Luckily, one brand dared to think differently and prove to the industry that consumers are more than ready to do business online. On July the 16th 2012 Subaru Australia made its new BRZ model available for sale online. 3 hours later all 201 cars available for 2012 were sold. Online! How they did it? Check out the .com here. They still take orders but you won’t get your car until sometime in 2013, and oh, you have to have an Australian driver’s license too. What Subaru have understood is that consumers want this service, or as they put it themselves; “At Subaru, we understand that you need time and flexibility when choosing a new car.” It’s about time in our humble opinion. If we needed more proof that online commerce is going to be an integral part of the car industry’s approach going forward, Audi UK announced on August the 8th that they have introduced a new service across the UK that lets Audi owners who drop their cars off for service, access a personalised online portal where they can see short video clips of the mechanic talking about the diagnosed repair work needed as well as letting the owners approve (or decline) selected repairs, and ordering the job to be done. If the automotive industry can change, so can your industry. Get in touch with Zooma if you want to discuss how we view online as a future component in your industry and the impact it will have.